So, remember Orb of Storms, that skill we use to generate Power Charges and Elemental Equilibrium / Overload? Maybe to apply Curses or Blind? Well, since 3.6, it's actually a viable skill in and of itself! Behold the Orb! ...of Storms. Clear like Storm Brand, single target like Divine Ire! DPS is ~3 mil Shaper for me, can be upto 4.6 mil with 21/20 gems and a few more levels, maybe a new shield. With trades leagues in mind, 6+ mil is quite possible. You clear with Chain, swap to Hypothermia for bosses (Guardians, anyhow), or Ele Focus if you have a white socket. You'll still Ignite with Storm Brand so it's fine. Get Leech either through Temple Amulet, Doryani's Catalyst, Cerberus Limb, Warlord's Mark ring, or like me with Berek's Grip. Those all work. Get Eldritch Battery for Infinite Mana and a larger life pool. In trade leagues, I'd argue that Inquisitor or Trickster might be overall better, due to Shield Charge ability and Regen / Spell Dodge. It's also possible to do this as non-acrobatics, and use Light of Lunaris and be a Block Build. Or even go full-on Trickster Eternity Shroud. This is just how I chose to do it with the gear I had. Whatever you choose, it plain works! Best of all, you can and should level as Orb of Storms, it works from very early on. Bandits = Help Alira, obviously. This is with my gear on SSF, so other than the chest, you can easily get better gear. An Inpulsa would boost clear speed by a lot, clearly. Easy to use Aspect of the Spider + Herald, easy to gear for leech, great DPS, can use Inpulsa. Great Regen, Immune to Shock/Freeze/Ignite/Chill, Fast Shield Charge, High Cast Speed. Don't take the points to Ignore Res, take the other ones. All the damage, Spell Dodge, some more ES + Evasion, High Cast Speed, more damage...? 75% Spell Dodge with Boots 15% + Chest 10% is fun. 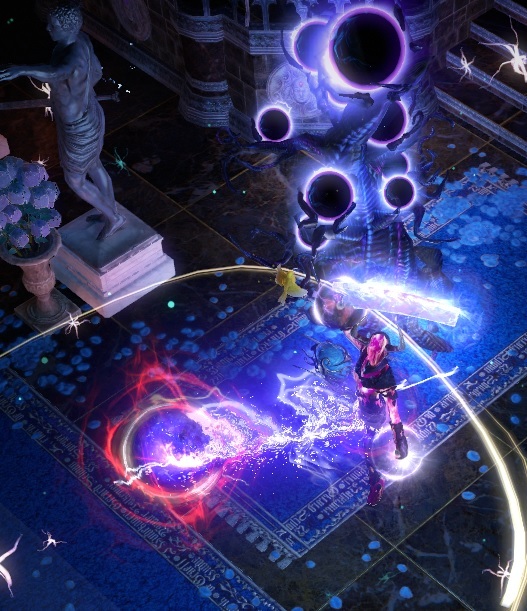 I'd argue that for general clear Trickster is safest, while for Uber Elder Inquisitor would lead, with Elementalist being a more esoteric choice and fastest with Inpulsa. Whatever you choose, it plain works! iam doing this on inqusitor - still low level (75) but it has a pretty high EHP and damage. i advanced it in levels but this is my actual gear (other then bottled faith which is next on the shopping list). gear can be improved but at 95 you would get with my gear to 2.8 mil. with better gear you can get a lot more. Nice guide review and work !! Great build, really fun!!! thanks! What about CI and/or occultist? Just about any caster works on Occultist, and would be very tanky. You'd probably lose quite a lot of DPS, but you should still have enough. If we're talking Low-life Occultist, it should reach similar damage and only be slightly less durable. looks like another awesome and unique playstyle from you yet again, going to be trying it in the coming week. What Ascendancy are you going to use?